A crash on the Red River Bridge would change their lives. When the accident occurred, Barrow managed to get help from a nearby farm family and even kidnapped two local lawmen in the process, using their vehicle to get the gang away. Barrow, Jones and Parker eventually rendezvoused with Blanche and Buck and they hid out in a tourist court near Ft. Smith, Ark., where they nursed Parker’s burns. In need of money, Buck and Jones robbed a Piggly Wiggly Supermarket in Alma, Ark. They bungled the robbery, however, in escaping they shot and killed Town Marshal Henry D. Humphrey. The killing forced the gang back on the road, despite Parker’s wounds. This is the car which Barrow flipped and in which Parker was burned. 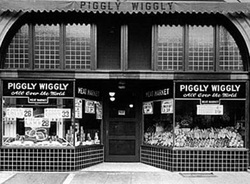 Jones and Buck attempted to rob this Piggly Wiggly Supermarket in Alma, Ark. the photo was taken in the 1940s. This was Humphrey's .38 taken by Jones during the killing. 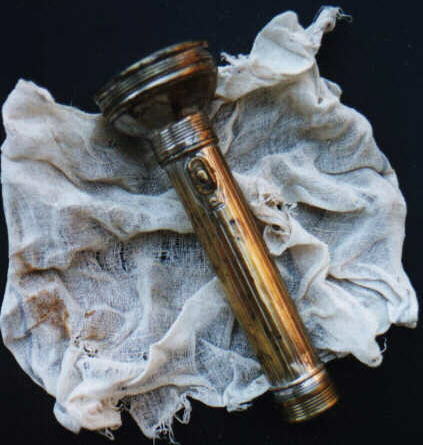 It was recovered from Barrow's car when he died about a year later. The Red Crown Court where the gang's conspicuous behavior drew the police, a gunfight and a mortal head wound for Buck Barrow. Police are gathered around the units the morning after the shootout. Bonnie Parker on the road. Clyde is seen cleaning his guns. On Tuesday, July 18, 1933, the gang checked into the Red Crown Tourist Court just south of Platte City, Mo. (now within the city limits of Kansas City, just across I-29 from Kansas City International Airport). The Red Crown Court was just two brick cabins joined by garages and the gang rented both units. To the south of the units stood the Red Crown Tavern, a popular restaurant and a favorite watering hole for Missouri Highway Patrolmen. Once again, the gang seemed to go out of its way to draw attention to itself. 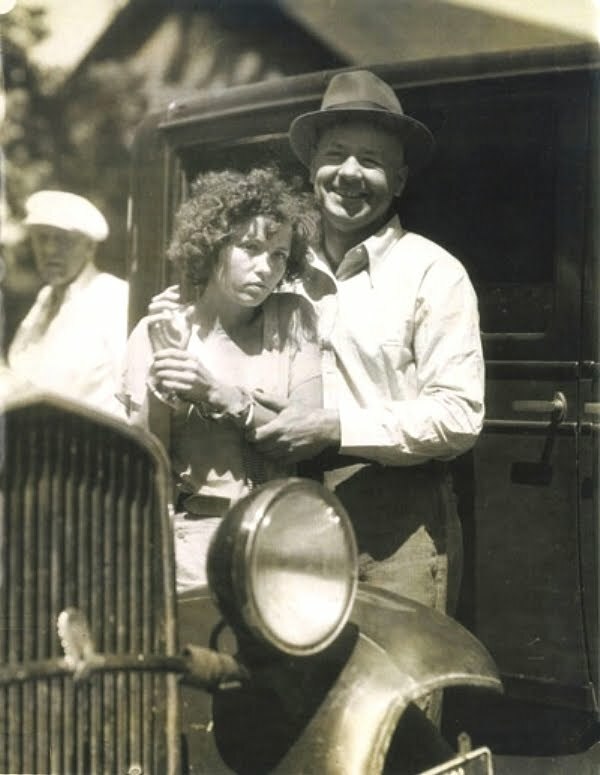 Owner Neal Houser kept an eye on the group from the beginning when Blanche Barrow registered the party as three guests, and Houser, out his rear window, could see five people exiting their car — which the driver backed into the garage, "gangster style," as he later told police. Houser's concerns were raised yet again when Blanche paid for the cabins with a bag of coins rather than with paper money. She did the same thing that night when she purchased five dinners and five beers, but again assuring Houser there were only three guests. The following morning, Houser saw that his guests had taped newspapers over all the windows of their cabins, and Blanche once again paid in silver for five meals. Even Blanche’s outfit — saucy, tight jodhpurs riding breeches — attracted undue attention. They were just not the kind of thing the upright, church-going women of Platte City would wear, and were the first thing mentioned by eyewitnesses reminiscing even 40 years later. That afternoon, Houser brought his concerns to the attention of restaurant regular William Baxter, a captain on the Missouri Highway Patrol. Coffey and Baxter at the Red Court. As Houser met with Baxter, Clyde and Jones were in town to purchase bandages, crackers, cheese, and atropine sulfate to treat Parker's leg. They also paid in silver and the way they acted raised concerns for the druggist who contacted Sheriff Holt Coffey. Because Coffey had been alerted earlier that week by state officials in Oklahoma, Texas and Arkansas to be on the alert for strangers seeking such medical supplies, he put the cabins under watch. After meeting with Baxter, who shared Houser's concerns, Coffey called for reinforcements from Kansas City, including an armored car. He was confident he had the Barrow gang trapped and he and his men would take them at once, dead or alive. At 11 p.m., on Wednesday, July 19, Coffey led a group of officers armed with Thompson submachine guns toward the cabins - a mistake he'd soon regret. The machineguns, although deadly, were not accurate from a distance and were no match for the gang's Browning Automatic Rifles, stolen July 7 from the National Guard armory at Enid, Okla.
Coffey called to the gang to surrender, that it was trapped. It's unknown who fired first, but within seconds both sides were shooting. Fearing an escape attempt, Coffey order the armed car to be moved in front of the garage doors between the two units to block any escape. Unfortunately, a bullet short-circuited the vehicle's horn and the lawmen at first mistook it for a cease-fire signal and shopped shooting. It gave the gang extra seconds to get into their car and burst through the garage door. The gang continued to fire as they drove away and the police, confused, out-gunned and the horn still blasting, did not pursue the retreating outlaws. Although the gang evaded law enforcement once again, Buck had sustained a horrific wound in the side of the head and Blanche was nearly blinded from glass fragments from a shattered car window that were lodged in both her eyes. The gang next surfaced five days later, on Monday, July 24, when they set up camp at Dexfield Park, an abandoned amusement park near Dexter, Iowa. So plainly mortal was Buck’s head wound that Clyde and Jones dug a grave for him and simply waited for his to die. All those could do for Blanche was to give here a pair of dark sunglasses. It wasn't long before their bloody bandages were noticed by local citizens, and it was determined that the campers were the Barrow gang. Surrounded by local lawmen and approximately one hundred spectators, the Barrows once again found themselves under fire. Clyde Barrow, Parker, and Jones escaped on foot. Buck was shot again, in the back, and he and his wife were captured by the officers. 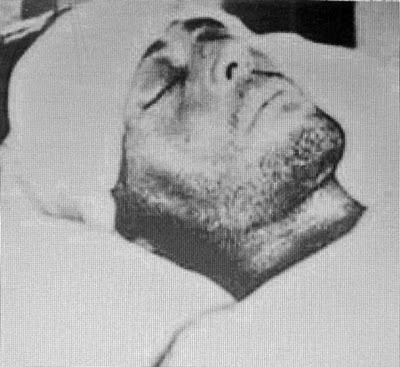 Buck died five days later, at Kings Daughters Hospital in Perry, Iowa, of pneumonia after surgery. Blanche was tried and sentenced to 10 years in prison for her part in the Platte City shootout, and served six years. She received state-of-the-art medical treatment for her eye injuries, but eventually lost all sight in the left eye. Following her release from prison, Blanche moved to Dallas and in 1940, she married Eddie Frasure. a year later, she completed her parole. In 1965, the couple adopted a 12-year-old boy named Ricky, from whom she later became estranged owing to his legal troubles. He died in 1969, and Blanche died from cancer on Dec. 24, 1988, just a week before her 78th birthday. She is buried in Dallas's Grove Hill Memorial Park under the name "Blanche B. Frasure." 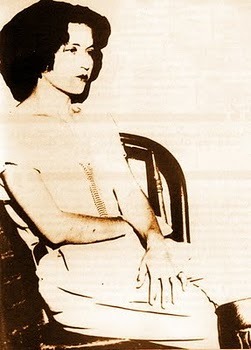 Her memoirs, "My Life With Bonnie and Clyde," based on her diaries and memories, were published in 2004. Lawmen hold Blanche Barrow, left, as Buck is being tended to. Buck is lying in the grass in front of the kneeing man in a t-shirt. He was a local vet who attempted to dress Buck's wounds. Blanche kept screaming, "Don't die, daddy. Don't die." A member of the posse happily posses with a confused and frightened Blanche. A flashlight and bloody banages found at Dexter Park. The items are part of an exhibition that was featured in a museum several years ago. 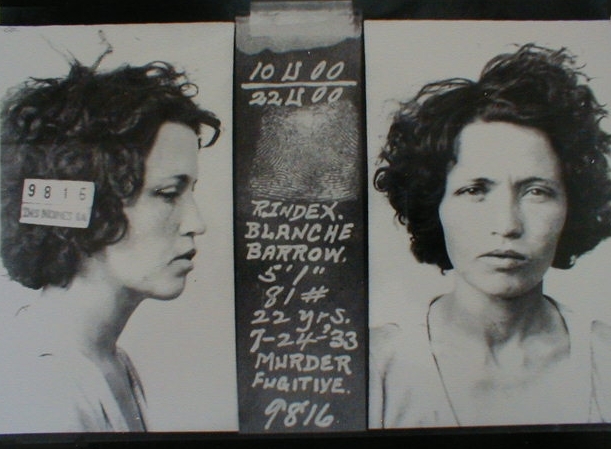 Blanche's mugshot is shown above. She is listed as being 5'1" and 81 pounds. An older Blanche is at right. Her damaged left eye is clearly apparent in the photo. Blanche washes the ink from her fingers after being finger printed. 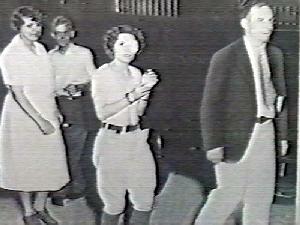 Blanche is led into the police station after her capture and arrest. For the next six weeks, the remaining trio ranged far from their usual area of operations — west to Colorado, north to Minnesota, southeast to Mississippi — always keeping a low profile and pulling only small robberies for daily-bread money. They restocked their arsenal when Barrow and Jones burglarized an armory at Plattville, Ill., on Aug. 20 and stole three BARs, several handguns and lots of ammunition. By early September, they risked a run back in to Dallas to see their families for the first time in four months. Jones continued on to Houston, where his mother had moved. he never rejoined them. Through the autumn, Barrow executed a series of small-time robberies in the area with a series of small-time local accomplices while his family, and Parker’s, attended to her considerable medical needs. 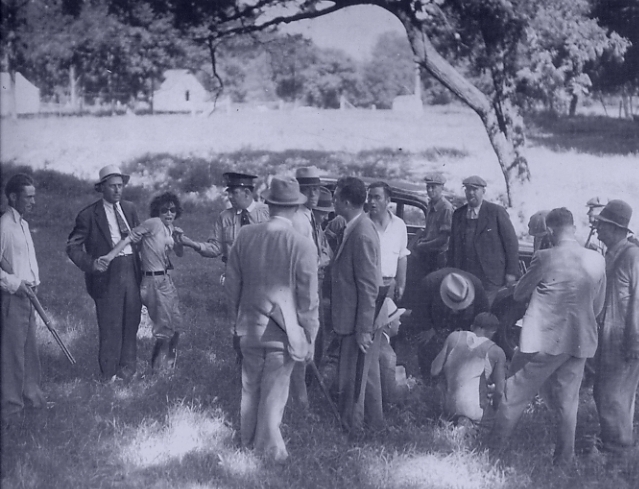 On Nov. 22, 1933, they again narrowly evaded arrest — but not bullets — while attempting to meet with family members near Sowers, Texas. This time, it was their hometown Sheriff, Dallas’s Smoot Schmid and his squad, lying in wait nearby. As Barrow drove up, he sensed a trap and drove right past his family’s car, at which point Schmid and his deputies stood up and opened fire with machine guns and a BAR. The family members in the crossfire were not hit, but not so the outlaws: a single BAR slug penetrated the car — and the legs of both Parker and Barrow. The couple made their getaway that night, but the attempted ambush would prove to be a dry run for two of the deputies present, Ted Hinton and Bob Alcorn, who would get another shot at the pair six months later in Louisiana. Barrow was furious at the shooting, and vowed to get Schmid. He later told his family he accepted being shot at, but it was not right they should shoot pass his family to get to him. meanwhile, Parker crossed an ominous personal threshold the following week when, on Nov. 28, a Dallas grand jury delivered a murder indictment on her and Barrow for the January 1933 killing of Tarrant County Deputy Malcolm Davis. it was the first murder warrant issued for Parker. Sheriff Smoot Schmid, left, Deputy Ed Caster, Sheriff Ted Hinton and Deputy Bob Alcorn are pictured after the Sowers ambush attempt. In the photo are items belonging to bonnie and Clyde. 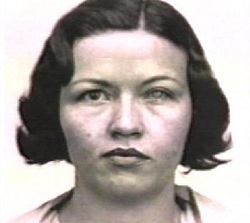 Alcorn and Hinton were two of the six posse members that would get Bonnie and Clyde in the weeks to come. Bonnie, lower right, sits with her mother, Emma, and Clyde's sister, Nell. Clyde stands above with his mother, Cumie, and a brother, L.C., along with Bonnie's sister, Billie Jean.